To Improve – provide greater access to the church, by expanding parking and accessibility. To Reinvest – support the Church for years to come with both functional and aesthetic enhancements. To Beautify – increase pride and excitement in our celebration of the sacraments in the House of God. To Conserve – reduce overall energy consumption as well as operational costs of the Church. Together, these goals have become the cornerstone of a true, local, Capital Campaign. This effort is centered on the idea that the time, talent, and treasure of our parish are best utilized within our parish. And that’s why we want your input and involvement to make this campaign a success. 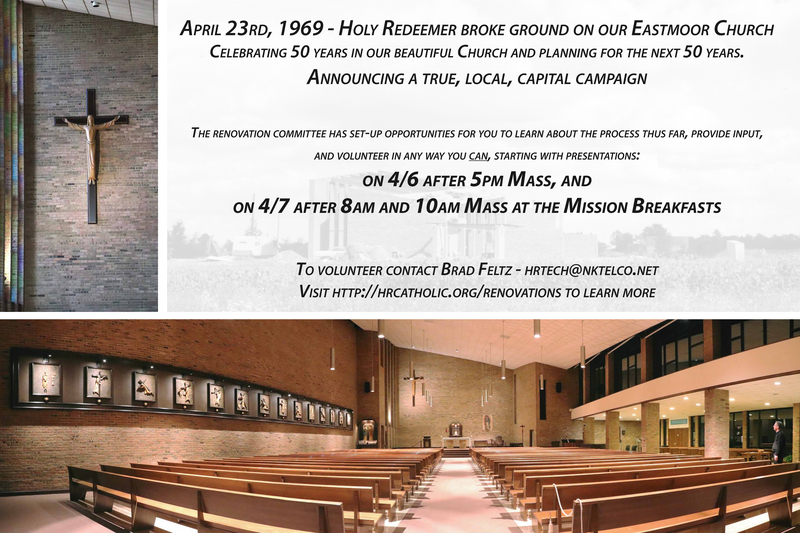 More information, as well as opportunities to get involved, will be presented around the Masses on April 6th and April 7th, and in the weeks following the Easter season. For those interested in donating their time or skills to this effort, please email Brad at hrtech@nktelco.net.